A dialogue has emerged over social media over the reaction and behaviour of a teacher of the tutory connected to the recent murder of the student who attended the tutory concerned which is situated down Elawella Road, Matara which incident created a shock to the whole country last Saturday. resulting in conflicts from time to time finally ended up with murder when one student armed with a knife had assaulted the other student with it in which instance in a short time the victim had collapsed on the ground, bleeding. On this occasion people in the area had got together and had tried to hospitalise the student by stopping the passing vehicle of the Chemistry teacher of the said tutory in order to put in the victim to the vehicle and rush him to hospital. However he has not consented to it. There the crowd of people had managed to get down a three-wheeler as an alternative and thereby take him to hospital. However, even by that time the student had passed away because of serious damage to his abdomen. In any case the people in the area have been disgusted over the behaviour of the Chemistry teacher of this tutory which transpired during the course of the brawl. 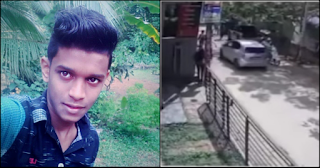 Schoolboy stabs and kills another student during the Matara brawl!